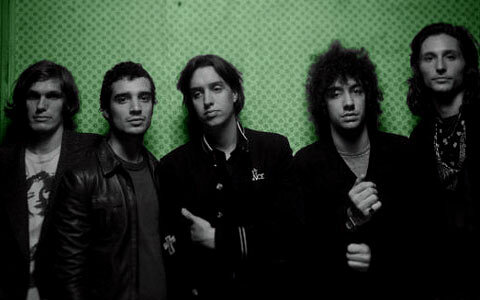 The Strokes Biography, Discography, Music News on 100 XR - The Net's #1 Rock Station!!! 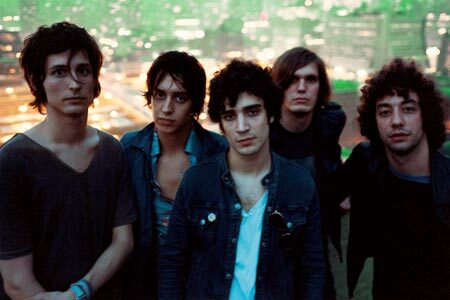 Emerging from the New York City underground scene, this Alternative-Rock band began its formation in 1998 when lead singer + songwriter Julian Casablancas, guitarist Nick Valensi and drummer Fabrizio Moretti started making music together while attending prep school; the line-up was completed over the next year with the addition of guitarist Albert Hammond Jr. and bassist Nikolai Fraiture. In January 2001, the quintet released the 3-song EP "The Modern Age" and six months later followed their debut full-length album, "Is This It", that received strong reviews on both sides of the Atlantic; released via Rough Trade/RCA, it soared to #2 in the U.K. and crested at #33 on The Billboard Top 200 chart spawning three smash singles: "Last Nite" peaked at #5 on The Modern Rock chart and crashed into the top 20 in Britain, "Hard To Explain" also cracked the U.K. top 20 and hit #7 in Canada; the final single, "Someday", became the group's second Billboard Modern Rock top 20 hit. The band's sophomore album, "Room On Fire", came out in October 2003, it was an instant smash hitting the top 5 in Great Britain, in the U.S. and Canada. The CD included two Billboard's Modern Rock top 20 hits: "12:51" and "Reptilia", which both also entered the British Singles chart peaking at #7 and #17 spots, respectively; the third single off of the record, "The End Has No End", was quite successful having stalled in the lower half of the top 40 on the same charts. January 2006 saw the release of The Strokes' third album, "First Impressions Of Earth"; the disc flew up the charts opening at #1 in Britain, climbing into the top 3 in Canada and ended up at #4 on The Billboard 200. "Juicebox" was the first single and quickly catapulted into the top 5 of the Official British chart, it was also a sizeable U.S. alt-Rock radio hit as it peaked at #9 on the Billboard chart. The album generated two more singles, "Heart In A Cage" which was one place short of cracking the Hot Modern Rock top 20 and "You Only Live Once" which reached #35 on the same chart. In the fall of 2009, frontman Julian Casablancas issued his debut solo album, "Phrazes For The Young". After five long years, The Strokes issued their much anticipated fourth album "Angles" in March 2011 which climbed into the top 5 on both U.S. and Top Canadian Albums charts. They immediately blazed up the Alternative Rock chart with the first single, "Under Cover Of Darkness", this track peaked at #12 and was followed by another Hot Modern Rock top 40 hit: "Taken For A Fool".